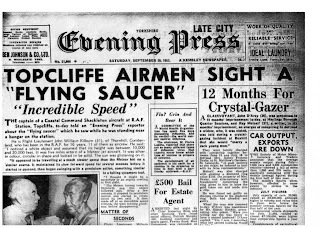 What follows is a collection of UFO reports were reported in the vicinity of the "Operation Mainbrace" NATO maneuvers that were held in September 1952. The maneuvers commenced September 13th and lasted twelve days. According to the U. S. Navy, "units of eight NATO governments and New Zealand participated, including 80,000 men, 1,000 planes, and 200 ships; in the vicinity of Denmark and Norway." The operation, directed by British Admiral Sir Patrick Brind, "was the largest NATO maneuver held up until that time." This case has multiple military credible witnesses from multiple countries (USA, England, New Zealand, Denmark etc) possible Presidental sighting and "excellent military photos" never released to the public. This case involves UFOs and USOs (Unidentified Submerged Objects), you could not ask for much more believable evidence then Operation Mainbrace. September 13--The Danish destroyer Willemoes, participating in the maneuvers, was north of Bornholm Island. During the night, Lieutenant Commander Schmidt Jensen and several members of the crew saw an unidentified object, triangular in shape, which moved at high speed toward the southeast. The object emitted a bluish glow. Commander Jensen estimated the speed at over 900 mph. Within the next week, there were four important sightings by well-qualified observers. (Various sources differ by a day or two on the exact dates, but agree on details. 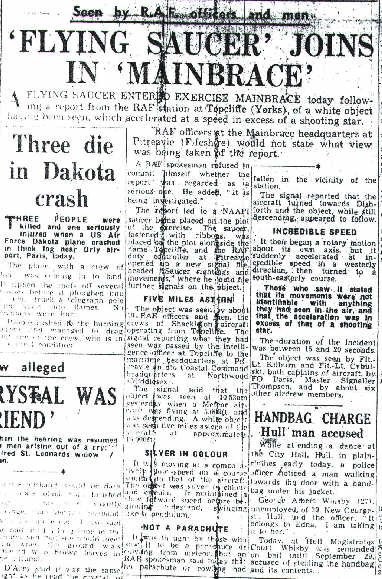 There is no question about the authenticity of the sightings; the British cases were officially reported by the Air Ministry, the others are confirmed by reliable witnesses. All occurred on or about September 20). September 19--A British Meteor jet aircraft was returning to the airfield at Topcliffe, Yorkshire, England, just before 11 A. M. As it approached for landing, a silvery object was observed following it, swaying back and forth like a pendulum. 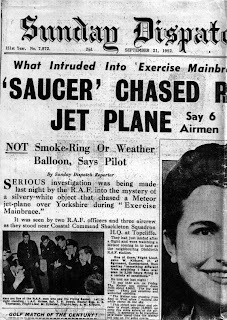 Lieutenant John W. Kilburn and other observers on the ground said that when the Meteor began circling, the UFO stopped. It was disk-shaped, and rotated on its axis while hovering. The disk suddenly took off westward at high speed, changed course, and disappeared to the southeast. About September 20--Personnel of the U.S.S. Franklin D. Roosevelt, an aircraft carrier participating in the Mainbrace maneuvers, observed a silvery, spherical object which was also photographed. (The pictures have never been made public). The UFO was seen moving across the sky behind the fleet. Reporter Wallace Litwin took a series of color photographs, which were examined by Navy Intelligence officers. The Air Force project chief, Captain Ruppelt stated: “[The pictures] turned out to be excellent . . . . judging by the size of the object in each successive photo, one could see that is was moving rapidly." The possibility that a balloon had been launched from one of the ships was immediately checked out. No unit had launched a balloon. A poor print of one of the photographs appears in the Project Blue Book files, but with no analysis report. September 20--At Karup Field, Denmark, three Danish Air Force officers sighted a UFO about 7:30 P.M. The object, a shiny disk with metallic appearance, passed overhead from the direction of the fleet and disappeared in clouds to the east. September 21--Six British pilots flying a formation of RAF jets above the North Sea observed a shiny sphere approaching from the direction of the fleet. The UFO eluded their pursuit and disappeared. When returning to base, one of the pilots looked back and saw the UFO following him. He turned to chase it, but the UFO also turned and sped away. 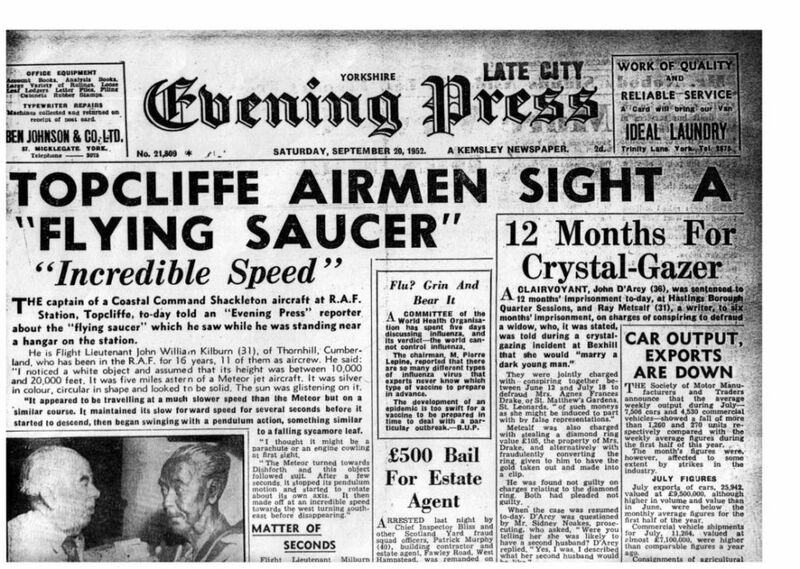 September 27/28--Throughout Western Germany, Denmark, and southern Sweden, there were widespread UFO reports. A brightly luminous object with a cometlike tail was visible for a long period of time moving irregularly near Hamburg and Kiel. On one occasion, three satellite objects were reported moving around a larger object. A cigar-shaped object moving silently eastward also was reported. Since existing documentation shows that U. S. Navy and Air Force Intelligence, and the RAF, were studying these incidents, it is a safe assumption that more information exists in the files of NATO, the British Air Ministry, the U. S. Navy, and the U. S. Air Force. The sightings remain unexplained. Follow this link for a list of top worldwide mass UFO sightings.